I discounted all of my recipe books that weren’t totally dedicated to chocolate. I gave a number to each of my eight chocolate books, ahem, yes I do have eight books completely dedicated to chocolate. At this point nerves set in. Having just got back from a few days away, I didn’t have much time; what if I got something complicated or wholly inappropriate or ……..? OK – deep breath. I asked CT to choose a number between 1 and 8. Number 3 gave me Linda Collister’s, Divine. I breathed a sigh of relief; although not ruled out, the chances of getting a really challenging recipe were significantly lessened. CTs second task was to close his eyes, flick through the book a few times and then stick his finger on a page chosen at random. Another sigh of relief on my part; he came up with a brownie recipe – yeah, I could do that. Apart from using wholemeal spelt, the only adaptions I made to Linda’s recipe was to use 85% dark chocolate rather than 70% and to add a pinch of salt. Melted 100g 85% dark chocolate in a bowl over hot water. Creamed 150g unsalted butter with 225g light muscovado sugar. Beat in 2 duck eggs, one by one followed by 1 tsp vanilla extract. Stirred in 175g wholemeal spelt, 1 level tsp baking powder and a pinch of rock salt. Spooned this into a 9″ square silicone mould and levelled with a knife. Scattered 100g chopped Brazil nuts over the top. Drizzled the chocolate over the top of the nuts, then swirled the nuts and chocolate through the cake mix. Baked at 180C for 17 mins, left to cool then cut into 16 pieces. This was not the easiest brownie recipe I’ve ever made. For me one of the joys of brownies are that they are so quick and easy. This one involved creaming butter (hard from the fridge) and sugar, which always involves a bit of muscle power and time. I’m not sure this really made much difference, but unless I make them again using my method, I’ll never be sure – hmmm, not a bad idea though! These brownies were a success. Visually they were interesting with their marbled effect creating an attractive colour contrast. They had the classic crispy top, were sweet with a butterscotch flavour and tasted delicious with an occasional hit of chocolate on the tongue. They were moist and the crunch of brazil nuts gave an interesting contrast in texture. But, for me they were just a bit too light to be thoroughly enjoyed as a brownie – a true brownie should be dense and gooey. CT liked the convoluted surface and enjoyed the toothy crunch from the Brazils Filling. Even though it was a bit hard, at least you had success with it! The combination of chocolate and butterscotch would be yummy!! nice and unique combination of ingredients..looks incredible! fantastic!… and I totally forgive your slight skewering of the rules to fit in with your blog… thanks so much for taking part, they look incredible… I hope the challenge was worth the effort.. well, to me it looks like it was! OH I took part at this chalenge too! I like your recipe! The brownies look yummy, I’ve never tried using brazils in brownies before but bet they add a nice crunch. Aforkful – in retrospect, I think you;re right. Johanna – if they didn’t have the brownie tag on these, I would have been highly impressed. They are delicious and well worth making. Brittany – they were very nice and not really that much work involved. Suman – thank you, they were very good both in looks and taste. Manu – I’ve seen the wonderful entry your daughter did for this challenge. 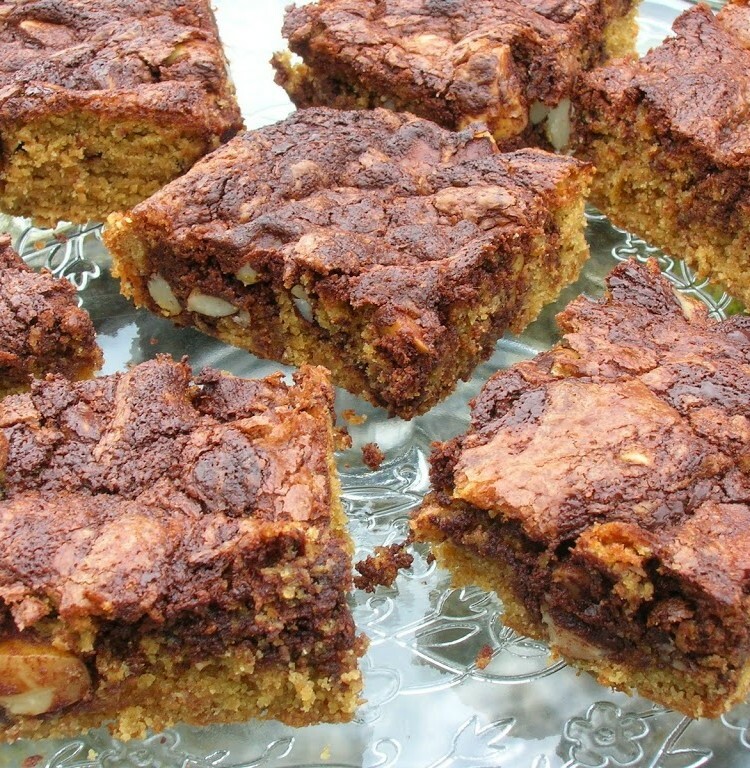 Katie – Brazil nuts were a first for me too in brownie, but the worked really well and I shall use them again. Brilliant idea. I love the flavour combination in this brownie – I’ll have to bookmark it to try. I’m not surprised that you have 8 books dedicated to chocolate! I didn’t join in Dom’s challenge because I didn’t want to blog about savoury recipes. It never occurred to me to be selective about the books that I picked from. Doh! Maybe next time! Wow – 8 chocolate books … I’m not telling you how many I have then lol. I do like to collect my recipe books! They look very nice! But yeah, can’t really see that a creamed mixture would ever give the nice fudgy density that I like in a brownie. Celia – the flavours were great and the Brazil nuts worked really well – it was just a bit too light in texture for a brownie. Baking Addict – thank you. Those eight are only the recipe books, I do have quite a few others that are all about chocolate. I actually discovered two more recipe books lurking in a book pile after I did this challenge! Chele – actually, I have a lot more than that. I discovered two more after the event and I have loads that are all about chocolate. I also have my eye on at least 4 more that I’d like to have!!! And you won one of them recently – congratulations. Foodycat – nice cake, forget about the brownie. These look a bit like a marble cake but shaped like brownies. I feel they should be renamed – that way they can’t disappoint someone craving a brownie fix. I love how you came about to do the recipe. Great fun! They look SO good. Mmmm…..looks very tempting. I love brownies any time. It’s so good with a cup of coffee. Corina – good point. Butterscotch marble squares? Jill – thank you. Despite my moaning, they were very good. Boy o Boy brownies are mouth watering, Love it. I love brazil nuts too – great recipe. This looks yummie, I will definitely have to try this!